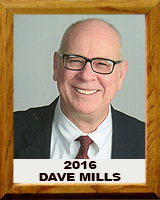 It all started in Tucson for Dave Mills. At Salpointe High School, he participated in basketball, track, and cross country, 1958-62. His senior year at Salpointe, he led the state in scoring, 25.6 ppg, and tied for second in the high jump at the State Track Championships. He was All City and All State, Salpointe Athlete of the year, and was inducted into the Salpointe Sports Hall of Fame. Mills held a few Arizona High School Basketball records, including 39 points in a State Tournament game. But all his records have since been broken except for 22 blocked shots in one game, which is still an Arizona record and number 5 in the National High School record books. Upon graduation, Mills chose De Paul University and was a 3 year starter for Coach Ray Meyer. He led his team in field goal percentage, over 50% each year, and is among De Paul’s all time leaders in rebounding, field goal percentage and scoring. As a sophomore, he was one of the leading rebounders in the country with an 11.2 per game average. Mills was inducted into the De Paul Sports Hall of Fame. He received De Paul’s Most Improved Player award in both his sophomore and senior years. As a sophomore, his De Paul team was ranked as high as number 5. His sophomore and senior teams went to the NIT, and his junior team went to the NCAA Tournament. Mills holds 2 records for the 1965 NCAA tournament, highest field goal percentage for a single game, 9 for 10, and for the tournament, 16 for 21. His all time NCAA Tournament field goal percentage is 76.2% right behind Bill Walton. Mills was drafted by the Baltimore Bullets, now the Washington Wizards, in 1966, but chose to play in the Italian Professional League instead. After a successful year, again leading his team in field goal percentage, he entered Law School at De Paul. He is still practicing law in Chicago at age 70. He is still married to his De Paul sweetheart, Maryann. They have three wonderful children and a granddaughter Gia, a champion dancer.